For decades, talcum powder has been a daily step in the personal hygiene regimen of many women. Now, mounting scientific research shows an alarming link to ovarian cancer, the deadliest type of cancer in the reproductive system. Johnson & Johnson Shower-to-Shower, when used over a period of years, is believed to cause ovarian cancer. At Harris Lowry Manton LLP, our Atlanta talcum powder liability lawyers have a respected track record of success in product liability cases. We have obtained numerous awards and settlements on behalf of injured victims. Talc product liability cases require experienced professional counsel who understand the complexities of strict liability law and who have the resources and working relationships to bring these cases in court. Our lawyers work with talc product experts who can explain why talc is a defective product and why it causes cancer. We also work with oncologists and other doctors who understand the severity and life-risks for ovarian cancer patients. Talc is the core ingredient in many products. It is effective for absorbing moisture and minimizing chafing. J&J has marketed talcum-based powders for their ability to provide a “fresh” feeling, a subtle appeal to the concern about personal hygiene. But scientists believe there could be a darker side to that pitch. Every year, more than 22,000 women are diagnosed with ovarian cancer. Of that group, 14,240 die. Courts of law are determining that enough evidence exists to prove talcum powder use is a factor in ovarian cancer, paving the way for other cancer victims to seek legal remedies. This year alone, two juries awarded ovarian cancer victims and their families a total of $127 million in damages in cases of women who used the Johnson & Johnson products for many years. Both cases were tried in the City of St. Louis Circuit Court. 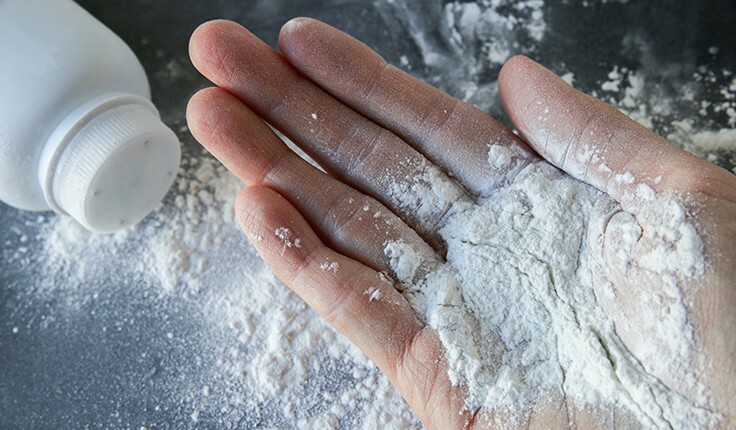 In February, a St. Louis jury found J&J liable for a failure to warn its consumers of dangers associated with talcum powder use, negligence, and conspiracy. They awarded the family of the cancer victim, who died before trial, $10 million in actual damages and $62 million in punitive damages. A second trial in May resulted in a $55 million verdict for a longtime J&J talcum powder user. In an October 2016 case, a jury awarded a woman $70 million because she got ovarian cancer, a danger that J&J failed to warn her about when she used the company’s baby powder product. The cases were reported by CNBC news. Talc is a mineral made of magnesium, silicon, and oxygen and is a close chemical relative of asbestos, which causes a rare form of terminal cancer and is now banned from many commercial and consumer uses. The evidence suggests that talcum powder causes internal inflammation over time if enough particles reach the reproductive system. Such inflammation is always present in cancer. Ovarian cancer typically occurs in women 50 years of age and older. The medical journal Cancer Prevention Research has reported a rise in cancer cases in which the patient used talcum powder. The American Cancer Society has issued a notice saying anyone who is concerned should limit or avoid its use. The International Agency for Research on Cancer classifies talcum powder used on or near female genitalia as a possible carcinogen. A Harvard Medical School gynecologist and epidemiologist, who in 1982 published his first study on the connection between ovarian cancer and talc, testified in trial that thousands more women might be at risk. Because of the growing evidence and the startling fatality rates, HLM is investigating and pursuing legal claims on behalf of ovarian cancer victims and their families. If you suffer any of the above symptoms, the most important action you can take is to seek treatment immediately for any of the conditions listed above. We have recovered compensation for hundreds of victims at trial and in negotiated settlements. You can call our Georgia talc attorneys at 404-998-8847 in Atlanta or 912-417-3774 in Savannah to schedule a free initial consultation. You can also fill out our contact form.